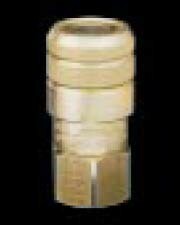 FFS06-08 - FF Series - Flush Face Hydraulic Coupler - Socket - Body Size: 3/8 in. - Thread Size: 1/2 FPT This item is sold individually. with the ball to connect and disconnect.